Despite the five hour drive required to reach it, the Hole of Horcum is one of my favourite places. After a one year break, it was again the venue for the North of England Open. Forty-three pilots entered the event, which is part of the F3F Eurotour series. True to form, a pea soup fog put paid to any thoughts of practice after I arrived on Friday afternoon. No worries - a giant haddock washed down with a pint, at the Fox and Rabbit, in excellent company, was perfect preparation for the two days ahead. Conditions on Saturday, at the Levisham slope, can only be described as weird, with strong breezes yet surprisingly little lift. Nevertheless several rounds were flown, with normal service resuming towards the end of the day. Sunday's competition took place in the main bowl of the Hole of Horcum. There were several short breaks for rain and again rather inconsistent conditions. Eventually eight rounds were flown. 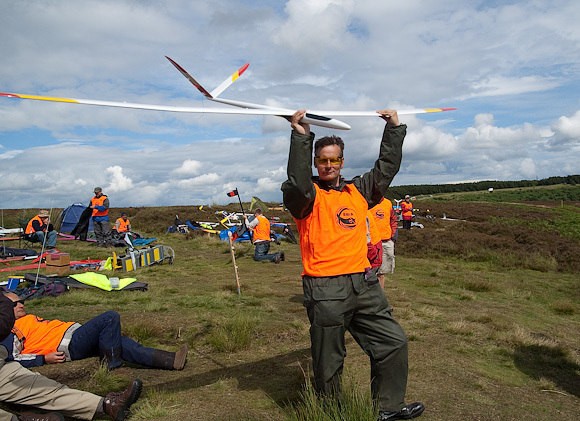 While it may not have been a classic competition, it was fun nevertheless, with some quite technical flying. Many thanks to Jon Edison and the NYMRSC crew for handling the event so adeptly in difficult conditions.